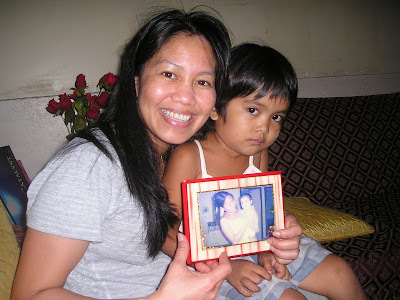 When I was conceiving with my daughter Rylie, I used to borrow this little girl in the picture with me. She used to be so chubby and I was admiring her so much. When we visit our place in the Philippines last month, I got to see her again and I can't believe how she have grown up. S is he still cute though and the cool things is she brought me the picture of us together when she was still a baby, so we took a pic again hehehe..
You guys like my uncomb hair? lol!